Caroline Hobkinson creates experimental dining experiences in both gallery, public and private spaces. She works with food as an artistic medium and explores both the ritual and spectacle of eating. In her projects, she orchestrates fully immersive multisensory dining experiences and food performances where the diners cease to be diners but become performers in a culinary ritual. Her projects are one time events, and have been done in gallery, public, and private spaces. She uses food as an artistic medium, and with food as performance and social commentary. Some of her favorite “ingredients” include fishing wire, helium, and liquid nitrogen. She had created experimental feasts for the Royal Academy, Salone Milano, the Barbican, Gwangju Biennale, and other places. On her site, Stirring with Knives, you can check out some of her projects. One recent project called LOOK. LISTEN. SMELL. TOUCH. EAT! 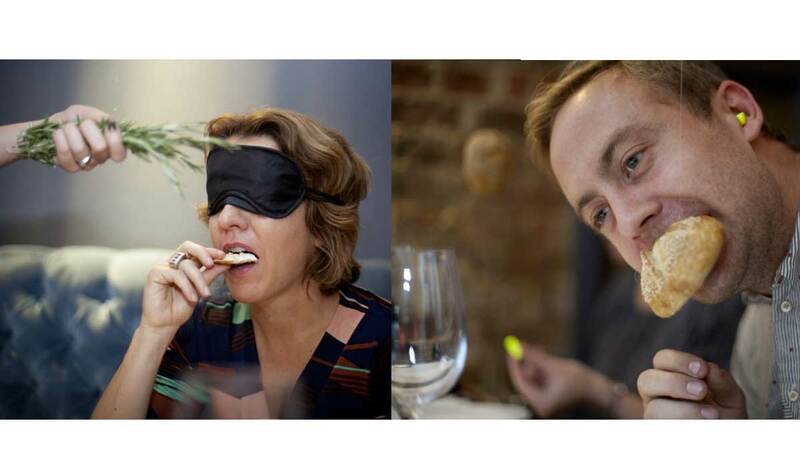 was a fully immersive sensory dining experience done by Hobkinson in collaboration with experimental psychologist Professor Charles Spence. the feast consisted of various courses and activities which included a dish of eating warm caramelized goats cheese while blindfolded. At the same time, the scent of roast peppers and rosemary was released so diners would taste and smell pepper and rosemary. For another course, people would eat super crunchy bread rolls while wearing earplugs, thus “internalizing” the crunch. For another course, called Dialing the Taste, diners were given a number and were asked to press 1 for sweet, 2 for bitter. Specially composed sound frequencies were played to alter the taste experience.. The diners were given a menu that also had directions for the event. This is printed on the website, and gives a full overview of the event and the courses. LOOK. LISTEN. SMELL. TOUCH. EAT! change how we perceive food experiences. Can you hear the taste? Can you see the taste? Salmon Sashimi accompanied by a Syringe filled with Ardbeg Ten Years Old. Revered as the peatiest and smokiest Single Malt. Taste sensations are picked up chemically by our tongue. The sensation of flavour is a combination of taste and smell. Most of flavour is smell. Can you smell the taste? Can you feel the taste? Research at Oxford University proved that by changing a sound alone we can change a taste from Bitter to Sweet. A low note brings out the Bitter, a high pitched sound brings out the Sweet flavour. Can you dial a taste? Images and updates of her projects can be seen on her website, Stirring with Knives.